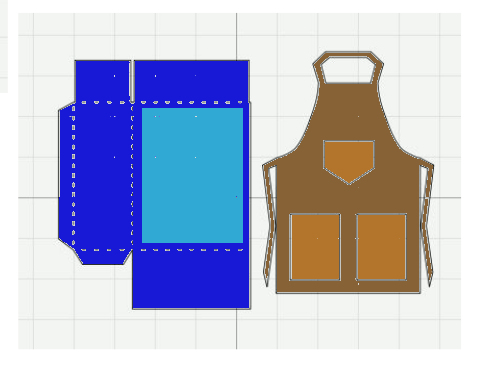 I had to resize the patterns from the Griller's Gear Set to make it fit on the box but it was easy to do. I have detailed pictures below to show you the steps. How to step by step. I brought the box into my program and made it the size I wanted to cut it out. 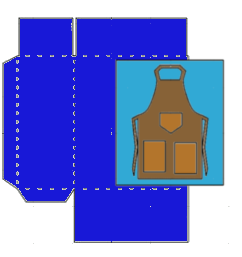 The dark blue represents the sides of the box and the light blue represents the decorative panels. 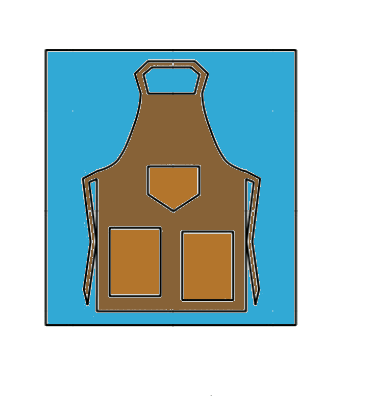 As you can see above, the apron pattern was too big for the decorative panel. I centered the apron over the decorative panel on my cutting mat and I started to size it down to fit into the area of my panel. Once it was the size I wanted, I then cut and pasted the apron into a different screen. I did this with the grill on the back too. I used the side and top panels as a guide to size the shalt and pepper shakers and spatula on the top. The above final diagram shows how all the layers will look just before cutting and the below picture shows the box with the cover off. I used pop dots to make the cutting files on the sides stick out and to stop the cover from going all the way down since I plan on putting a big bag of m & m's in here. I had some fun with this card. I used a beige for the apron but then went back with a brown chalk ink pad and inked the pocket edges and then just started dapping and streaking the rest of the apron to give it a worn look. Below is the back of the card. The apron string wraps around the side of the card onto the back where a spatula hangs off of it. How cute is that? This is so awesome Jearise! Love that you created that box and the card matches perfectly. I am so excited that you are now a part of the SDS team!